The medical journal Mayo Clinic Proceedings marks its 90th anniversary today. What began on April 21, 1926, as a way for Mayo physicians to exchange information has evolved into an international peer-reviewed medical journal that ranks in the top 7 percent of journals of its type. Its mission statement today is, "To promote the best interests of patients by advancing the knowledge and professionalism of the physician community." In a press conference at 11 a.m. CDT, editor-in-chief Dr. William Lanier will briefly outline the history of Proceedings and take questions from journalists. 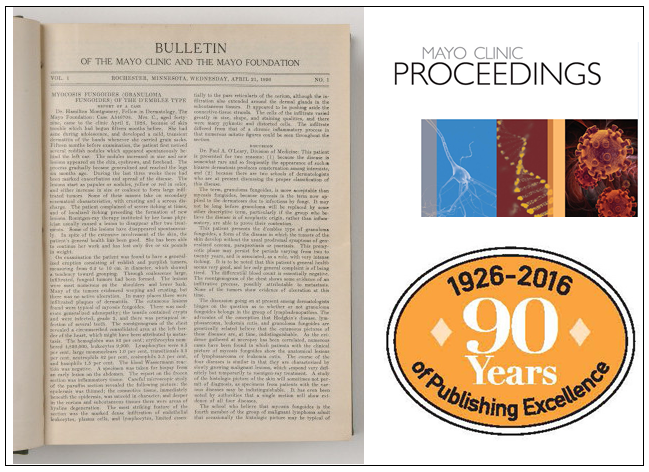 In its 90 years of publication, Mayo Clinic Proceedings has grown from its origins as a provincial, in-house journal to its current status as one of the world's foremost biomedical journals. Today it reaches an immense audience worldwide, and—consistent with the Mayo brothers' dream of advancing medical care through the sharing of information and ideas among physicians and scientists worldwide—the Proceedings now benefits from input by authors and peer reviewers from around the globe. The anchor for these efforts remains a Journal mission and mission statement that have close ties to Mayo Clinic values and a loyalty to advancing the quality of health care through integrated progress in clinical care, medical research, and medical education. Journalist, see the media advisory for more information on today's press conference at 11 a.m. CDT. Mayo Clinic PathWays April 19: What’s the Diagnosis?